Yesterday we have finally received a working version of Another World for the Zodiac, thanks to the efforts of Chrillith, and thanks to the support of the game's creator Eric Chahi. What is perhaps even more important though, is that Chahi has recently re-released the game for Windows XP. His new website has a great deal of information that wasn't previously available, and the new version of Another World can be downloaded in demo form there as well. I thought that the demo was a little short, but it still impressed me. Because the game uses vector graphics, they are scalable and still look good at higher resolutions. The maximum noted on the website was 1280x800, but I was able to increase it in the options menu to my desktop resolution of 1600x1200. A far cry from the games original 320x200 back in the day. 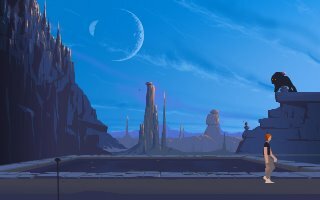 Even more beautiful are the new high resolution background images which grace the scenes of Another World. I think this may very well be worth the €7 ($9.33) that Chahi is asking for the full version. The game may be frustrating, but it is still an icon in gaming history. More than that, however, it is now more than ever a work of art that should be experienced.